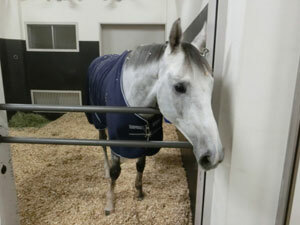 The two foreign contenders for this year’s Grade 1 Japan Cup, Capri (Ireland) and Thundering Blue (UK), arrived safely at Narita International Airport in Chiba Prefecture late Wednesday. 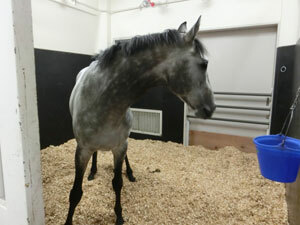 Both horses were then transported to the quarantine facilities at the JRA Horseracing School Quarantine Center, where they arrived at 7:43 p.m., completing about a 24-hour journey for Capri and a 28-hour journey for Thundering Blue from their respective home stables. Capri, a 4-year-old colt by Galileo and trained by Aidan O'Brien, has 6 wins from 15 career starts, including the Grade 3 Alleged Stakes in April. He finished fifth in the Prix de l'Arc de Triomphe behind Enable, followed by a fourth in the Champion Stakes at Ascot in late October. Thundering Blue, a 5-year-old gelding by Exchange Rate, is 6-for-21 in his career, with four seconds and thirds. After a third in the Grade 1 International Stakes at York in August, he is fresh off a runner-up finish in the Grade 1 Canadian International at Woodbine in October. The Japan Cup will be run on Sunday, Nov. 25 at Tokyo Racecourse, with a scheduled post time of 15:40 local time.